Crackdown In Harare Sparks Fears Of Return To 'Old Zimbabwe' The streets of Harare were quiet a day after troops fired on opposition protesters waiting for the results of Zimbabwe's presidential election and convinced the vote was rigged. Six people died. 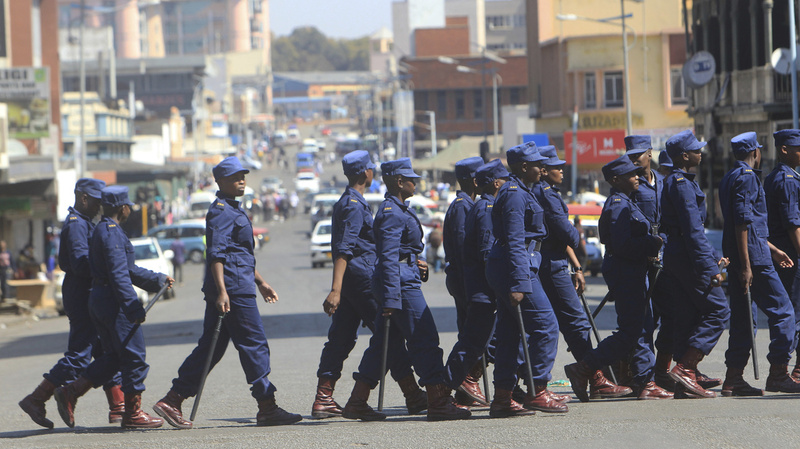 Zimbabwean police patrolled the streets of the capital, Harare, on Thursday. Police said six people died when army troops opened fire on protesters the day before. As Zimbabweans waited on tenterhooks to learn the winner of the country's presidential election, a deadly crackdown on opposition protesters in the capital spurred fears of a return to the days of authoritarian rule under Robert Mugabe. Six people died after army troops opened fire on opposition protesters in Harare on Wednesday, according to police. Demonstrators took to the streets, angry that the winner of Monday's vote still hadn't been announced and convinced that the vote has been rigged to benefit incumbent President Emmerson Mnangagwa and his party, the Zimbabwe African National Union-Patriotic Front. The response was swift and severe. "All of a sudden, armored vehicles moved in with soldiers manning machine guns and the streets cleared out," NPR's East Africa Correspondent Eyder Peralta reports from Harare. "We saw soldiers hitting people with sticks. We saw a helicopter, a military helicopter ... buzzing the city and you could see a soldier on the helicopter pointing a machine gun at people." One other thing of note: all my interviews are now in my head. No one wants to talk on mic, no more names and even my notebook spooks people, who are afraid they will be targeted later on. That was not the case on Monday. Witnesses told The Associated Press that some soldiers fired at random into crowds and beat up bystanders who were not involved in demonstrations. Thursday dawned very differently in Harare, as the military kept the streets clear and shops were ordered shut. Quiet descended as people waited for election results expected later in the day. Mnangagwa tweeted his condolences to the families of those killed a day earlier and affirmed his commitment to accountability, pledging to bring those responsible to justice through an "independent investigation." Presidential results delayed by verification process, chief election agents of candidates still going through through V11 forms from close to 11 000 polling stations: ZEC. Zimbabwe's Electoral Commission said it was still counting ballots cast for Mnangagwa, 75, and Nelson Chamisa, his 40-year-old opponent. State broadcaster ZBC said results were delayed by a "verification process" and that officials were still sorting through forms from some 11,000 polling stations. The electoral commission had said it would announce a winner within five days of the vote, in accordance with Zimbabwean law. Mnangagwa said Thursday that he wanted to "move beyond" Wednesday's violence, tweeting that he has been in touch with his Chamisa "to discuss how to diffuse the situation." But Mnangagwa himself has a feared reputation. He heads ZANU-PF, the same party of former longtime leader Mugabe. And Wednesday's crackdown was reminiscent of the iron-fisted tactics Mugabe employed to crush dissent during his near four decade-long rule. Mugabe was removed from power in a bloodless coup in November and replaced by Mnangagwa, his onetime deputy. "It feels a lot like the old Zimbabwe," Peralta reports. "People will no longer give me their names. They will no longer talk on tape. When I take out my notebook they are scared — they fear retaliation." Opposition member Job Sikhala told Peralta that the military came to his house and opened fire. Sikhala said his family fled and he slept in the bathroom of a neighbor's house. The goal, according to Sikhala, was intimidation. Reuters reports the military's swift response reinforced suspicions that the generals who helped oust Mugabe remain the country's de facto rulers. Meantime, international leaders urged for calm. United Nations Secretary-General António Guterres called on "political leaders and the population to exercise restraint and reject any form of violence while awaiting the announcement of the election results." The U.S. Embassy in Harare also weighed in, tweeting, "Zimbabwe has an historic opportunity to move the country towards a brighter future for all its citizens. Violence cannot be a part of that process."